SHOWING TWELVE-CYLINDER CONSTRUCTION Here you will see a picture of the famous "Twin Six" or 12-cylinder engine which it is necessary for you to know all about, a sectional view of the engine showing you the "V" type construction, similar to that used in the 8-cylinder car. It was not so many ears ago that a well known manufacturer introduced the 6-cylinder car. A couple of years ago along the same 8-cylinder car. The latest improvement is the 12-cylinder car, which is fast becoming popular in the highest priced cars. I don't know how much farther the manufacturers are going to go, but they can't make them any faster than I can buy them, and when the new models come out, you will find them right here at the school, and mind you, it will be here for you to practice on, not just to look at. No improvement or equipment for which there is a demand on the market is too good for me to buy for the students' use. That is the reason I promptly bought a 12-cylinder car at a high price, took the engine out of the chassis, mounted it on block right here in the school where you have a chance to work and practice on it. I have always made it a rule never to advertise anything I did not have, and when I advertise anything, it is expressly understood that it is for the students' use, training and instruction. I don't believe anybody can fool me on an automobile school, and I am not foolish enough to think I can fool anybody else. For that reason, I want you to read every word on this website, knowing it is a plain, truthful statement of just what I have here at the school, how I teach the automobile business, and why you should get into the automobile business if you want to make big money. Of course it costs a lot of money to keep buying these new things as rapidly as they make their appearance on the market, but at the same time, I feel that when a man pays his money for tuition in this school, he is entitled to thorough, all-around training and you will not be thoroughly trained, all-around automobile man unless you know 12-cylinder engines. 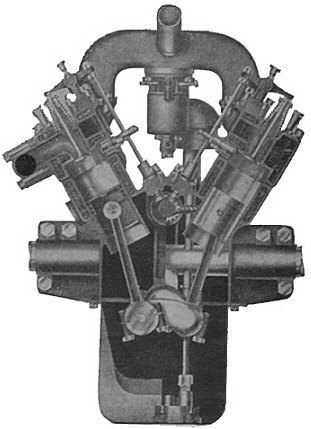 I understand the factories which make these 12-cylinder cars are way behind in their production right today, and the result will be when you get into the automobile business you must be prepared to be confronted at any time with a 12-cylinder engine to repair and you will know exactly how to do it, because you have done it right here in the school.